THIS CHARMING 1920 TRADITIONAL BUNGALOW HOME LOCATED IN LARCHMONT IS READY FOR A NEW OWNER! WITHIN WALKING DISTANCE TO LARCHMONT ELEMENTARY. BEAUTIFUL INVITING PORCH. LARGE BEDROOMS. BONUS ROOM ON THE 2ND FLOOR. BUILT-INS. LARGE BACKYARD. NEAR BASE, RESTAURANTS AND SHOPPING. PRICED TO ALLOW NEW OWNER'S PERSONAL TOUCHES..
Ready to visit 1218 Westmoreland? Request a free property tour! Get pre-qualified by a local lender! 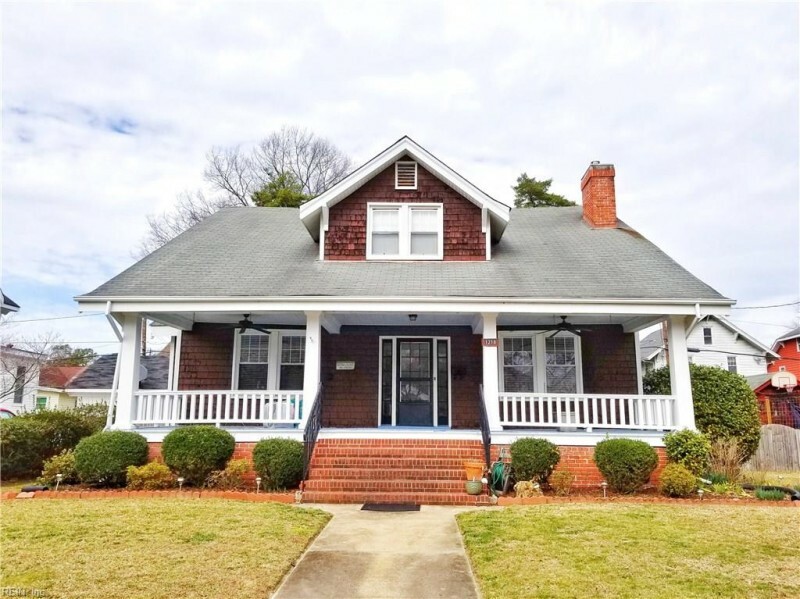 Send me more information about the listing at 1218 Westmoreland, Norfolk, VA 23508, MLS# 10240002. *Tax information provided by listing agent. Please independently verify this information. Assumes average annual homeowners insurance premiums of $900. Total cost does not include private mortgage insurance (PMI). Taxes estimated for illustrative purposes only. * Estimates Only! Your rates may vary and will affect your monthly payment. This 4 bedroom, 2 bathroom home located at 1218 Westmoreland, Norfolk, VA 23508 has approximately 2,268 square feet. It is currently listed for $335,000 and has a price per sqft of $14,771. This home is currently Active under the MLS#: 10240002. This listing is provided by Rose & Womble Realty Company. 1218 Westmoreland Avenue, Norfolk was built in 1920. It has Street parking.The kitchen includes Dishwasher, Dryer, Elec Range, Refrigerator, Washer. 1218 Westmoreland is part of the Larchmont neighborhood located in 23508. © 2019 REIN. REIN's listings Data and information is protected under federal copyright laws. Federal law prohibits, among other acts, the unauthorized copying or alteration of, or preparation of derivative works from, all or any part of copyrighted materials, including certain compilations of Data and information. COPYRIGHT VIOLATORS MAY BE SUBJECT TO SEVERE FINES AND PENALTIES UNDER FEDERAL LAW. Some or all of the listings (or listings Data) represented in this application have been enhanced with Data not provided by REIN. The enhancements are as follows: Recent Home Sales, Street Maps, and Street View Images. The source of these enhancements are: Onboard Infomatics and Google Maps provided by Google Inc. The "share to a friend" feature is only available for registered users! Login or create an account to use this feature.